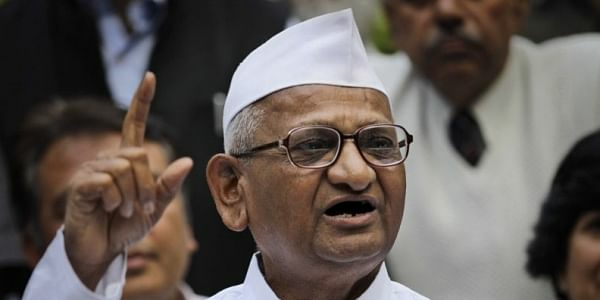 Anna Hazare's ongoing tour to various states to interact with the masses will culminate in New Delhi on March 23. ITANAGAR: Social activist Anna Hazare today advocated for immediate constitution of Lokayukta in Arunachal Pradesh to end corruption in all spheres. Addressing a public gathering here which was christened as Anna's satyagraha here, the anti-corruption crusader said that after covering all states, his tour will culminate in New Delhi on March 23 with a mass dharna. His tour to various states was apolitical to interact with the masses to know the status of development and their grievances, he said. "The pothole-ridden state capital road whose many stretches were damaged by landslides was horrible while naked electric poles standing tall all along reflecting the level of development," the 80-year-old social activist said. "These are minor problems in every state which the respective government could solve but ignorance is the hallmark of present-day governance," Hazare said. "There cannot be development without participation of the people," he said. "Democracy is powerful if the political parties rise above blame game to serve with sincerity, commitment and dedication," he said.